P2-billion Reintegration Program for OFWs to help them start a good life in the Philippines. Sounds good, right? After all, the idea is you can settle and grow old here in the Philippines without having to worry about your financial situation. You know what they say, if it’s too good to be true, then most likely it’s not true. Surely, OWWA means well. They wouldn’t offer this kind of services to Overseas Filipino Workers if their intention is not to help you, bagong bayani. Unfortunately, applying for OWWA Loan is not as easy as it seems. OWWA Loan is all about business loan, which means they will need all the necessary documents to prove that you are really opening a business. Therefore, you will need documents like Mayor’s Permit, Certificate of Registration with DTI, and Barangay Clearance among many others. This can be tedious and time-consuming to prepare since government offices won’t release it overnight. Whether or not you want to apply for an OWWA Loan, make sure you secure the necessary permits and business documents to legitimize your business. This way, the documents are readily available in case you decide to apply for additional working capital. This will speed up the loan application process as well since the documents are complete. 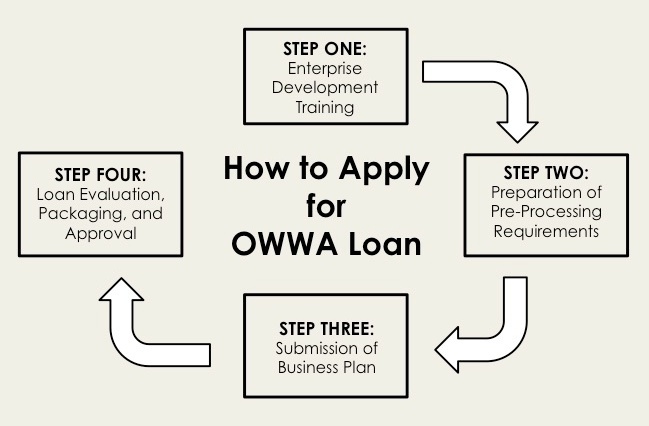 Here is a detailed list of requirements needed when applying for OWWA Loan. One of the common questions we get from OFWs is if they can apply for a loan eve if they are still working abroad. The answer is yes, although this can be a tedious process. OWWA Loan is offered to active OWWA members who were also certified as OFW. You need to get that certification first since you will present it to Landbank as part of the requirements. Contact the Welfare Officer of the Philippine Embassy in the country where you are working. The Welfare Officer will verify your registration to OWWA as OFW. Once verified, the Welfare Officer will refer you to an OWWA Office in the Philippines. On your return to the Philippines, make sure to visit the said OWWA Office to get the certification. Present the OFW Certification to Landbank together with the other requirements. You can also execute a Special Power of Attorney authorizing your spouse or any immediate family member who are of legal age to act and transact on your behalf in case you need to go back to your work abroad. The answer is yes. In fact, a Certificate of Attendance as proof that you went through EDT is a necessary requirement when applying for a loan. Through EDT, you will be taught various strategies and techniques in managing, sustaining, and dealing with issues in your chosen business. Immersion program is also part of the training to give you an idea and experience on how to handle the business. 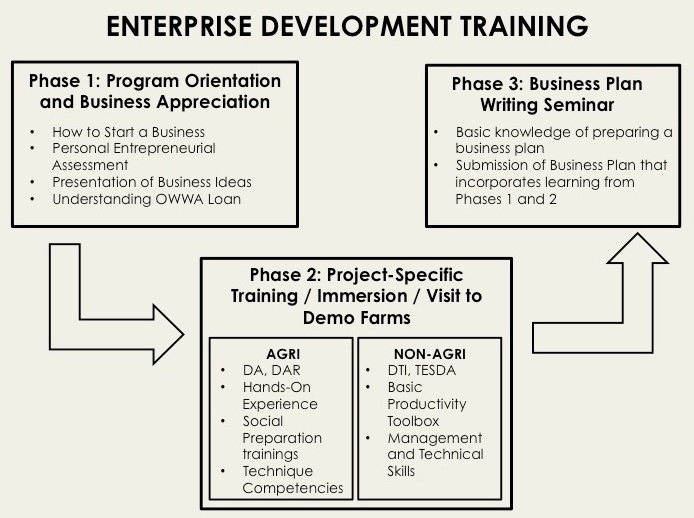 Check with the OWWA Office near you regarding the schedule for Enterprise Development Training since it will depend on the regional office. The duration of the training may also last for minimum of one day due to the immersion. Check this post to learn more about Enterprise Development Training. Another common issue raised by many OFWs is the lack of property or any other asset under their name, which they can use as a collateral for their loan. Collateral is an important aspect of OWWA Loan because at the end of the day, OWWA wants assurance that they will be paid. Even if the OWWA Loan is principally a non-collateral loan, you need to present mortgageable assets for loan security purposes. Other contract agreements like Purchase Order or Deed of Assignment. You may also apply with a co-borrower, preferably in good credit standing, to help facilitate the loan process. You surely want a higher amount when applying for a loan. After all, you can use the excess funds to other equally important expenses. Unfortunately, that won’t happen, especially if you can’t prove your capacity to pay. Keep in mind that the P2-billion OFW Reintegration Program is a project between OWWA and Landbank. This means Landbank is also in charge of processing every loan application, which also means they will look closely at every loan applicant to determine whether s/he is worthy of credit. There are several factors to consider such as credit history and collateral among others. Your business plan will also be closely scrutinized to ensure viability and sustainability of your proposed business. Even if you are granted a loan, there is no assurance that you will be granted as much as P2 million. OWWA Loan is specifically for business purposes. This is why you are required to go through all the training and immersion program to help you prepare for the entrepreneurial life. Once OWWA sees that the purpose of your loan is for personal use, say construction or acquisition of property, then outright rejection is possible. Still, don’t look at OWWA Loan negatively. This type of loan has benefits since the facility is specifically offered for Overseas Filipino Workers. Nonetheless, don’t limit yourself with OWWA Loan. There are many lenders who are willing to make loan processing easier and more convenient for you. There are two types of Overseas Filipino Workers or OFWS: land-based workers or seafarers. Here’s the next question: Can seafarers also apply for OWWA loan? The government provides many benefits for OFWs, whether you are land-based or working on seas. One of them is the OWWA loan under the reintegration program. The main purpose of this program is to provide enterprise development intervention and loan facility for OFWs and their respective families. It also helps migrant workers to establish a viable business enterprise that could provide you a steady income and at the same time, create employment opportunities for people in your community. The program does not define what type of overseas Filipino worker is covered by OWWA loan. Rather, the program highlighted “OFW who is also a certified OWWA member” as eligible borrowers, which means the borrower can either be land-based or a seafarer. At the same time, Overseas Workers Welfare Association or OWWA is mandated to provide programs for sea-based migrant workers including loan programs such as OWWA Loan. This means as long as you belong to the OFW category, regardless if you are working on land or in the sea, you can avail of this type of loan facility. 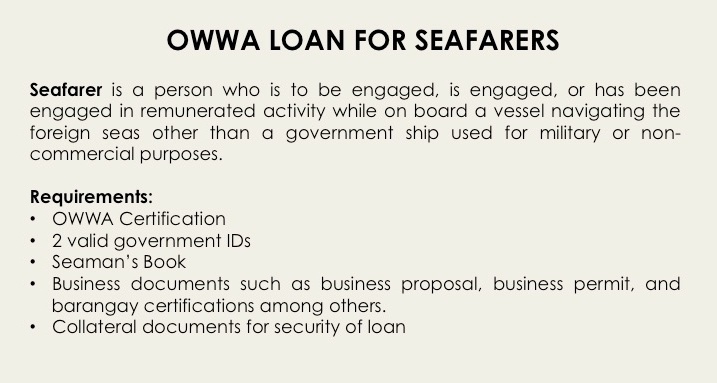 This also means as a seafarer, you can apply for OWWA loan in case you want to put up your own business allowed by the program, allowing you to borrow from P100,000 to P2 million. Know more about OWWA Loan here. OWWA certification stating that you are a bonafide OWWA member. Special Power of Attorney (SPA) duly authenticated by the Philippine consul in case you are not in the Philippines. Business documents such as business proposal / feasibility study, business permit, and barangay certification where the business is located among others. Collateral documents for security of loan such as real estate mortgage or chattel mortgage. For detailed list of requirements, click here. When availing of OWWA loan, you also need to undergo Enterprise Development Training as part of the requirements. Click here to know more about this. Keep in mind that you need to go through a process for the approval of your OWWA loan. This post will give you an idea as to the step-by-step process when applying for this type of loan facility. It doesn’t matter whether you are a seafarer or working on the ground. The government provides benefits for Overseas Filipino Workers for all the hard work and contribution you are giving to the country.